Make it easy to snack or work at your sofa with this lift top cocktail. Plus, when the table top is lifted, you have access to two bonus storage compartments. 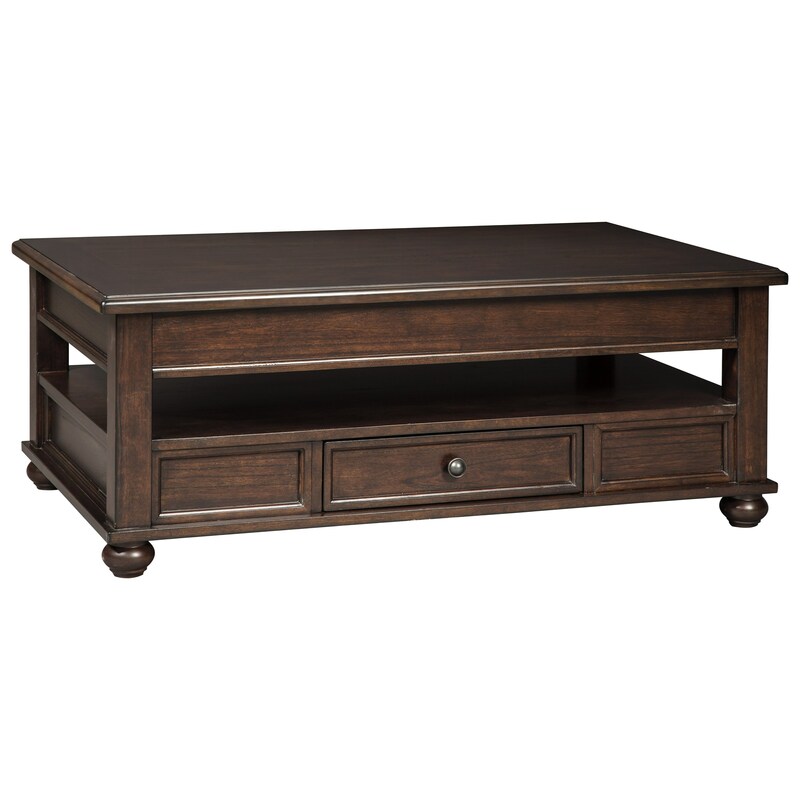 Made of mindi veneers and hardwood solids in a dark brown finish, the elegant bun feet and molding details elevate the table's design. Additional storage includes the table's spacious open shelf and drawer. The Barilanni Lift Top Cocktail Table by Signature Design by Ashley at Michael's Furniture Warehouse in the San Fernando & Los Angeles area. Product availability may vary. Contact us for the most current availability on this product. Storage Drawer interior 16.63" x 13.25" x 2.88". Opening 45.38" x 25.63" x 3.75". Lift top side opening (2) 7.88" x 23.13" x 2.25". Lift top extended height 47.63". The Barilanni collection is a great option if you are looking for Transitional furniture in the San Fernando & Los Angeles area. Browse other items in the Barilanni collection from Michael's Furniture Warehouse in the San Fernando & Los Angeles area.